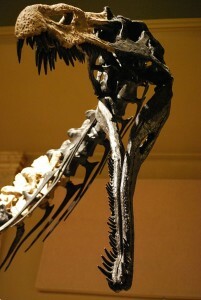 Skull and neck, from specimen at the Kenosha Dinosaur Museum. Cretaceous of Northern Africa. The animal is reminiscent of crocodilians that eat mainly fish due it having very long snout and narrow jaws studded with up to 100 teeth. The teeth were not very sharp and curving slightly backward. Suchomimus also had an extension of vertebrae, which held possibly a hump or a ride on the animal’s back. Another unique feature, like Baryonyx and possibly Spinosaurus, was the curved sickle-claw on the thumb. Suchomimus is mentioned in Jurassic Park III as a possible candidate of what attacked the Kirbys’ jet. Suchomimus, however, is not an animal on Isla Sorna as this conversation is purely that of classification of what Alan Grant, Billy Brennan, Udesky, and the Kirby family saw. Billy is simply going through a list of animals that are possible candidates for their attacker, under Grant’s direction. Billy identifies the spinosaurids incorrectly. For example, Baryonyx is “bigger” than Suchomimus in the scene. It’s only after Grant identifies the animal properly that the new topic, but somewhat related, conversation begins with what was on InGen’s list. This is not a confirmation for the animal existing on Isla Sorna. If Suchomimus is there, on the off chance, it’s possible it would be named or lumped into being a variant of Baryonyx. This logic comes from the fact that InGen would not publish any papers regarding “new dinosaur discoveries” as the nature of the research on Isla Nublar and Isla Sorna was a closely guarded secret. Contrary to the above is that on the Jurassic World website Suchomimus is listed as being on the Cretaceous Cruise attraction. This may mean it is on Isla Sorna after all, but it is still very debatable.